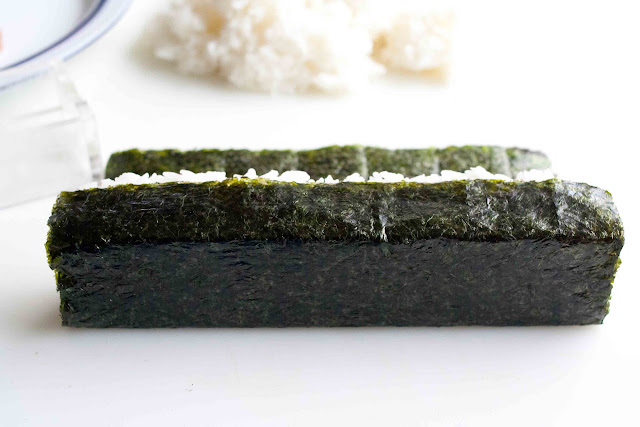 Together with a wrapping of nori (seaweed sheet) make Spam Musubi. 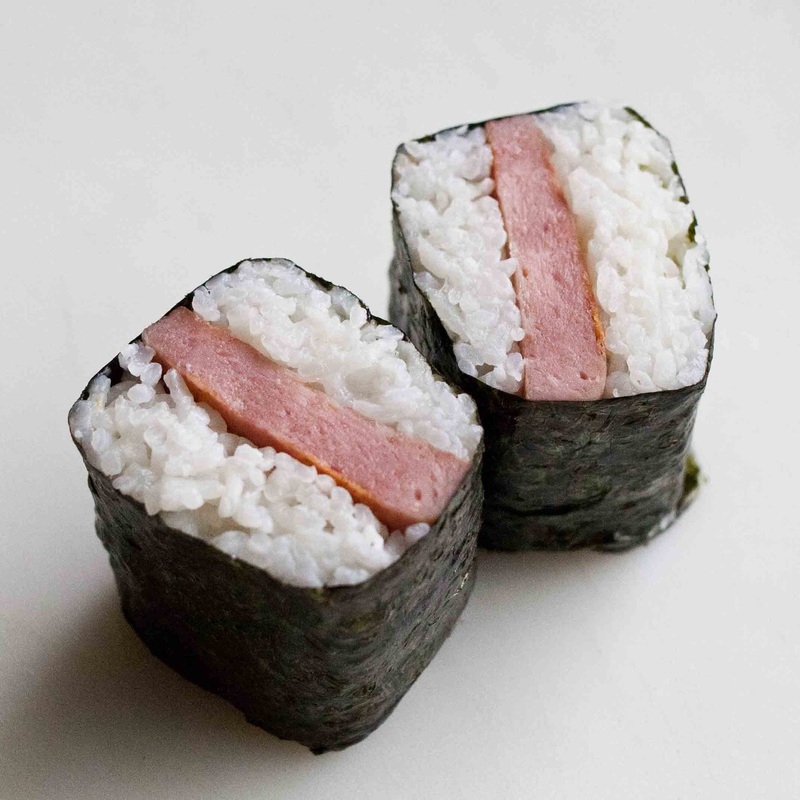 My understanding is that spam musubi came from Hawaii, but my neighbors say they have this all over Tawian, too. 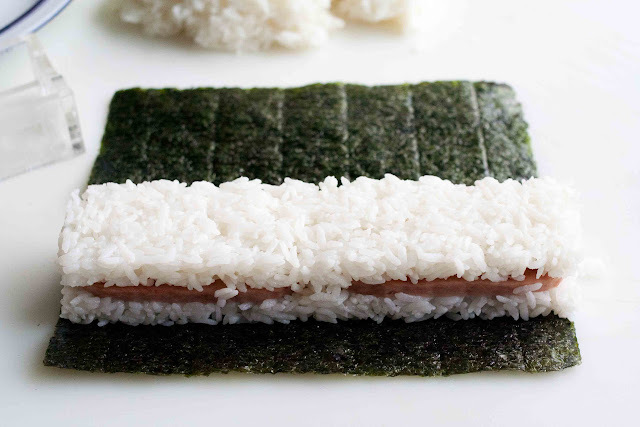 There's lots of different ways to make spam musubi, if you Google it you can see all the different variations. 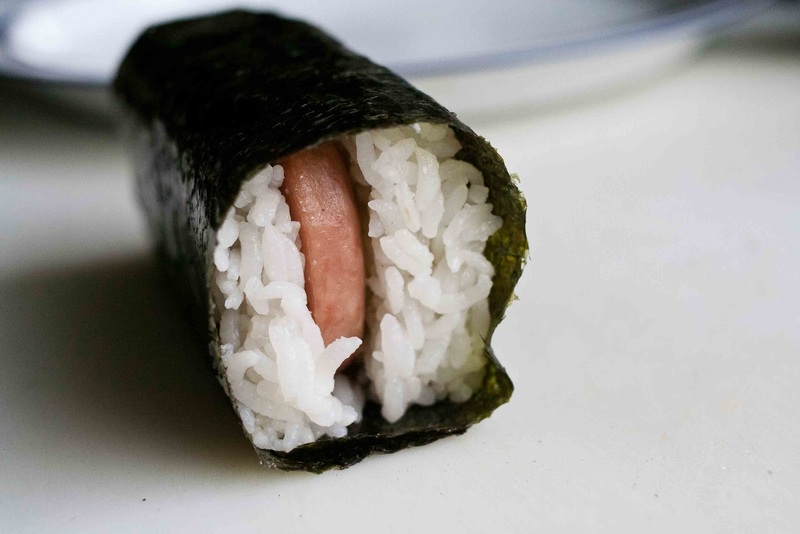 Here, you'll find instructions for the spam musubi pictured below. We didn't eat Spam very much when I was growing up, my mother didn't like it. She said she ate a lot of it in Camp--Rowher, Arkansas, where she, as a Japanese American, was incarcerated during WWII with her family. Not fond memories for her. But our current family memories are pushing those over. Now, she'll eat an piece of spam musubi and enjoy it. For family pot-lucks, someone will make spam musubi, it's popular and almost always gets eaten up. If there's any left, it's the one thing the boys will want to take home. You can find the acrylic spam maker at a Hawaiian market or Japanese market like Marukai. Ebay and Amazon.com also have it. 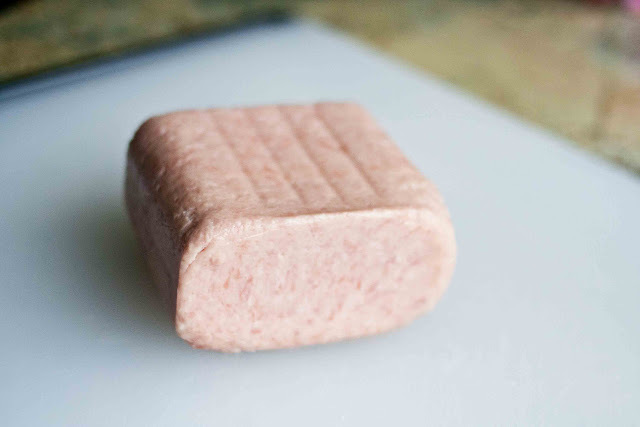 In case you've never had Spam before, this is what it looks like, right out of the can. Slice the Spam into about 1/4 inch slices. My goal is usually to make 10 slices, but mostly it comes out to 9. 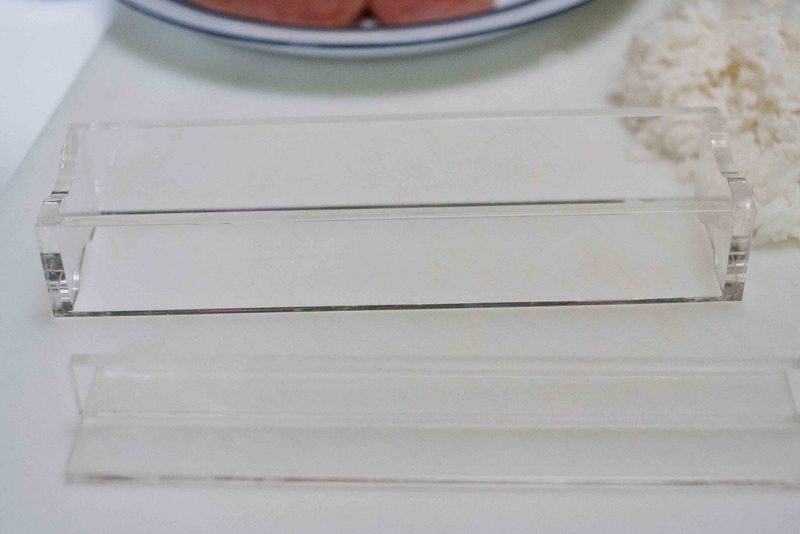 A spam slicer--yes, they have them--makes 9 slices. But since you use 2 slices per roll, 10 is better. Besides, I think you only need a small taste of the Spam in each bite. Put the slices into a heated frying pan. 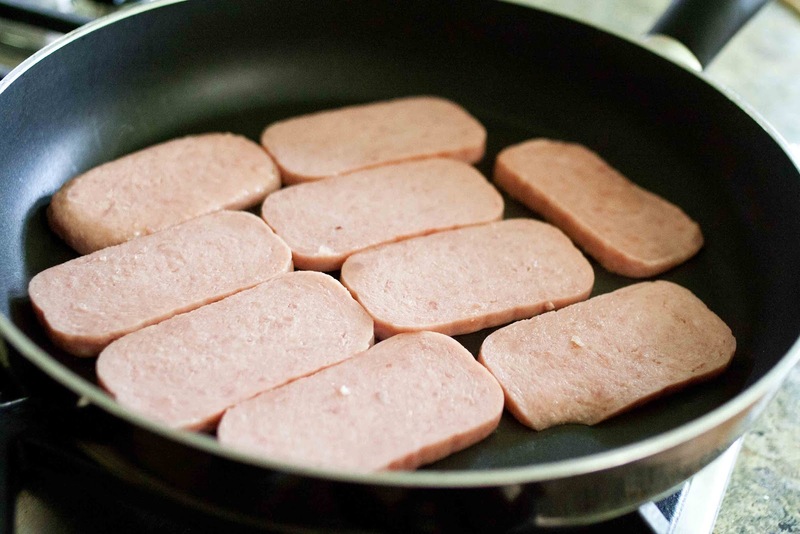 Lightly pan fry the Spam. You don't want to crispy fry it, that will make it hard and dry. Cook the rice how you would normally cook rice. 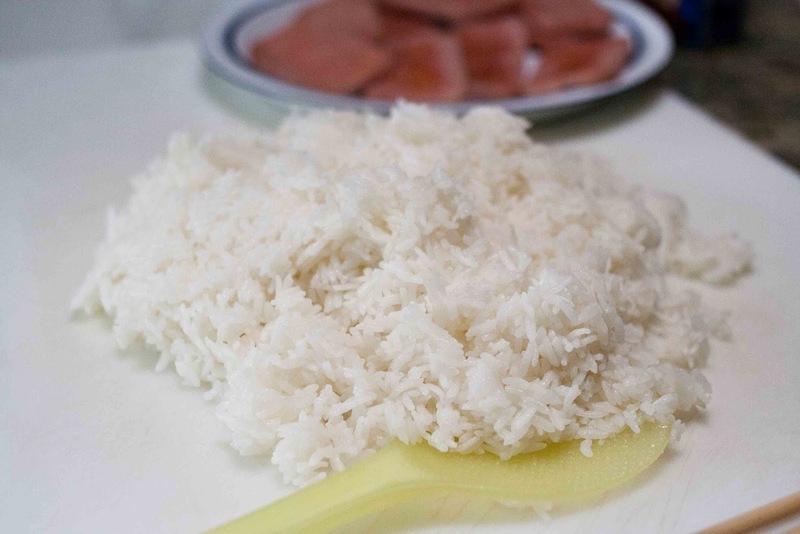 You'll need a small bowl of water next to your work surface to wet your board and hands to keep the rice from sticking. 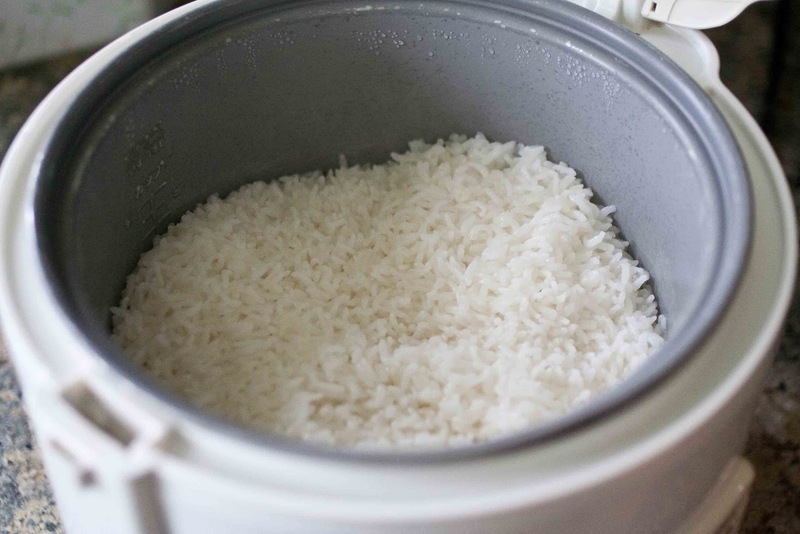 Wet your work surface a little, empty the rice pot onto the work surface and spread it out so the rice will cool. 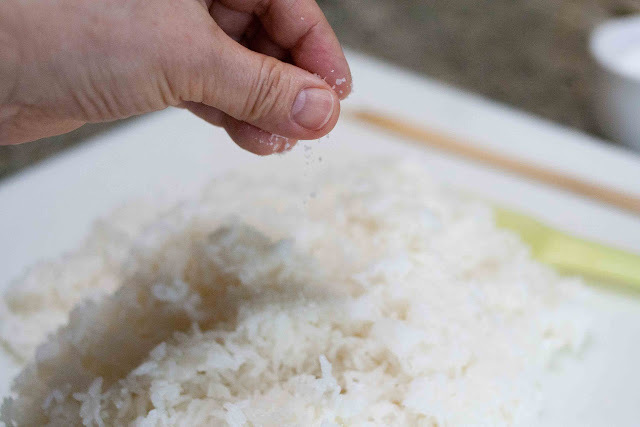 Lightly salt the rice, and mix. Cool the rice before you start putting the spam musubi together. If the rice is too hot, the nori will shrink and pucker. 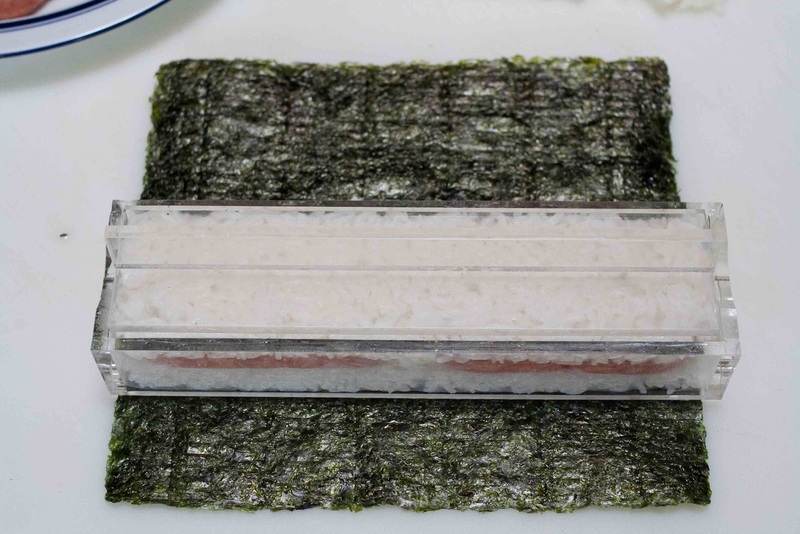 This is the spam musubi maker. It's just an acrylic frame and tamper. Some of them have grooves in the tamper, that will make it so the rice doesn't stick to it, so if you have a selection, get that one. I bought this 50 sheet package at Marukai market, but you can get one with 10 sheets. There's two sides to a sheet of nori. A shiny smooth side, and a rough side. This is the shiny side. Place the shiny side down. You'll be able to tell--the pictures don't really show the difference very well. 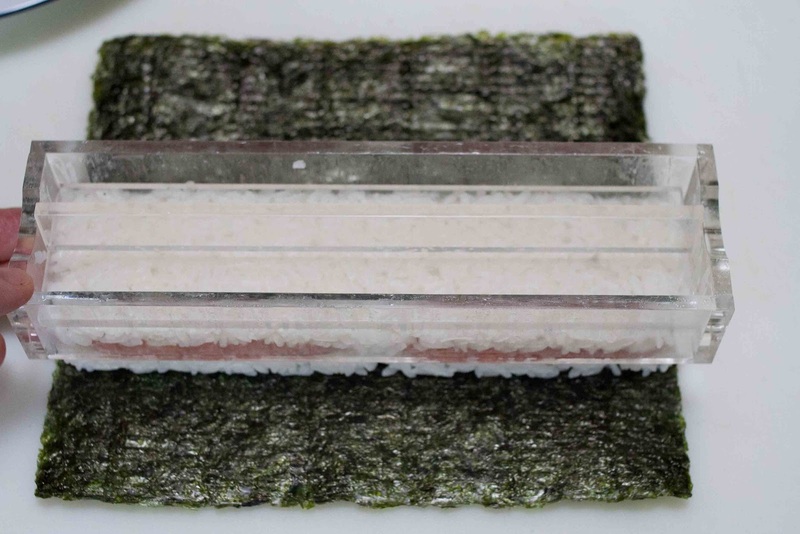 Place the musubi maker about 1 inch from the edge. That looks like it needs to be moved down a little, doesn't it. 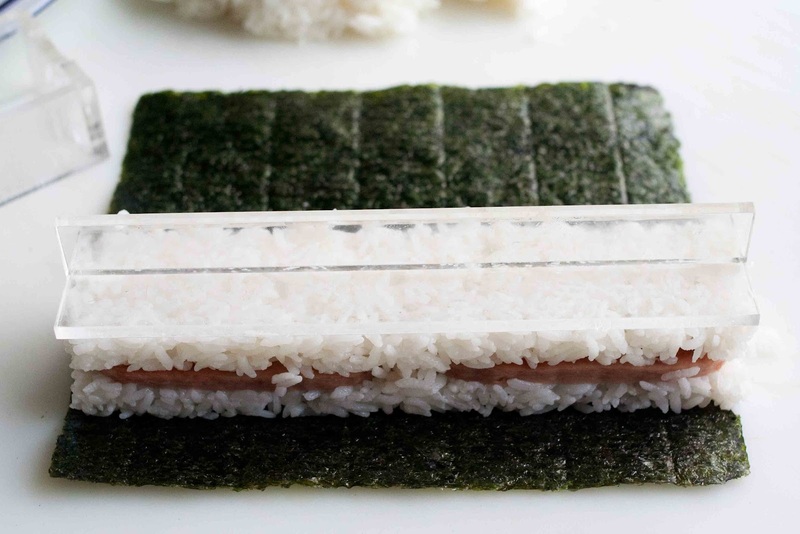 Then add a thin layer of rice into the spam musubi maker, spreading it out with your fingers. 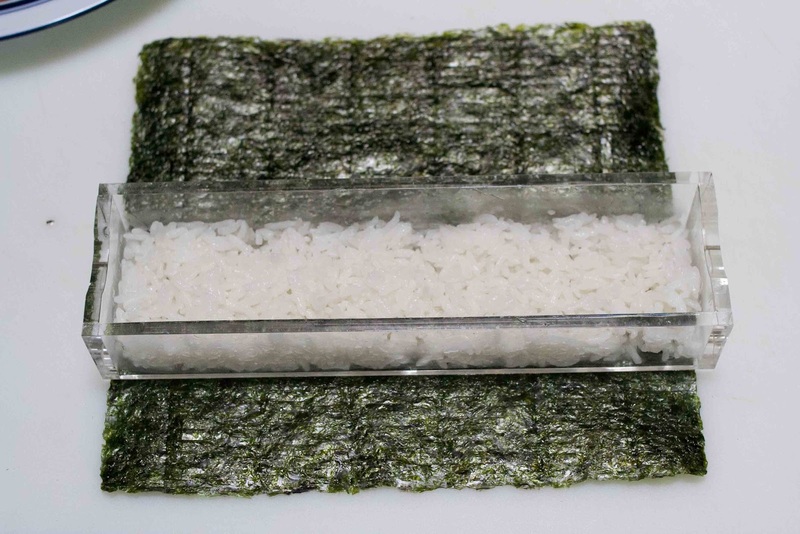 It's about two small handfuls of rice. Use the tamper to tamp it down gently. You don't want to mush the rice together--which will happen if you push it down too hard. 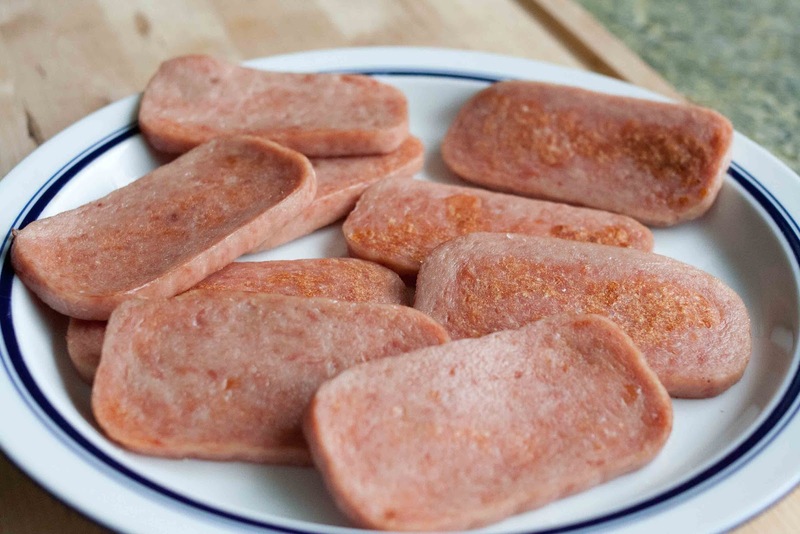 Then add the two slices of Spam. 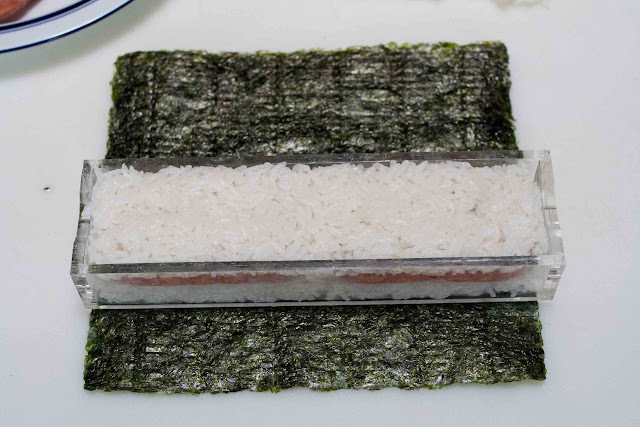 Then another layer of rice. 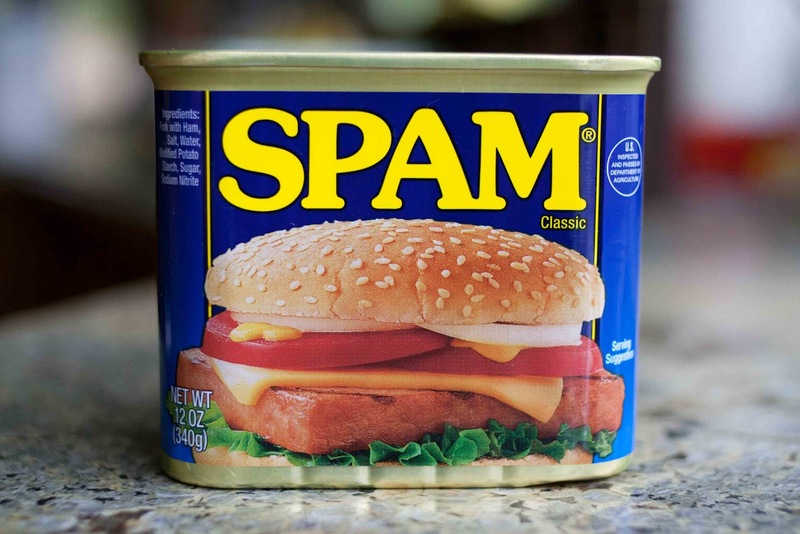 Ideally, the Spam will be in the middle. Tamp the top layer down gently. Lift the frame up over the tamper. 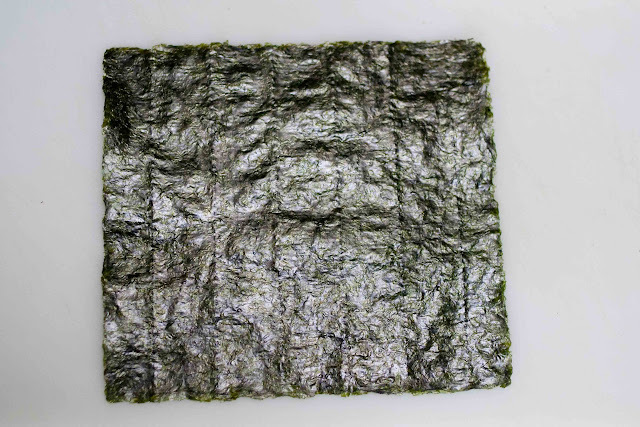 On my second roll, the nori was placed a little better. 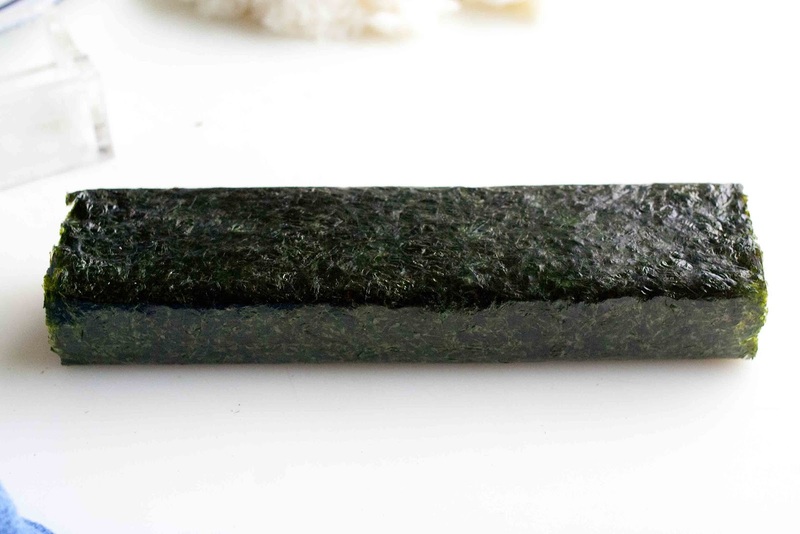 Take the tamper off the top and flip the bottom piece of the nori up. 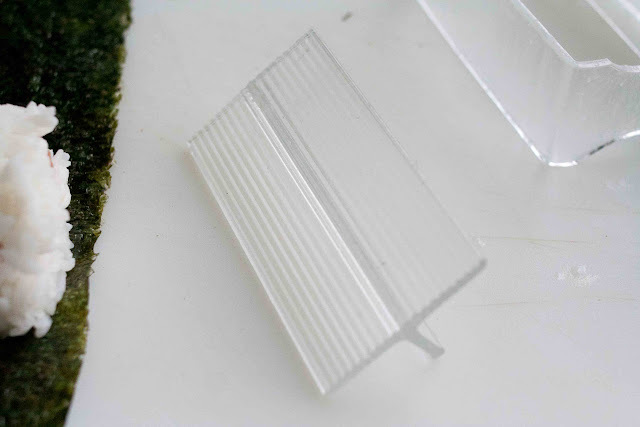 It's okay if it goes over the top edge, just fold that part over the top. 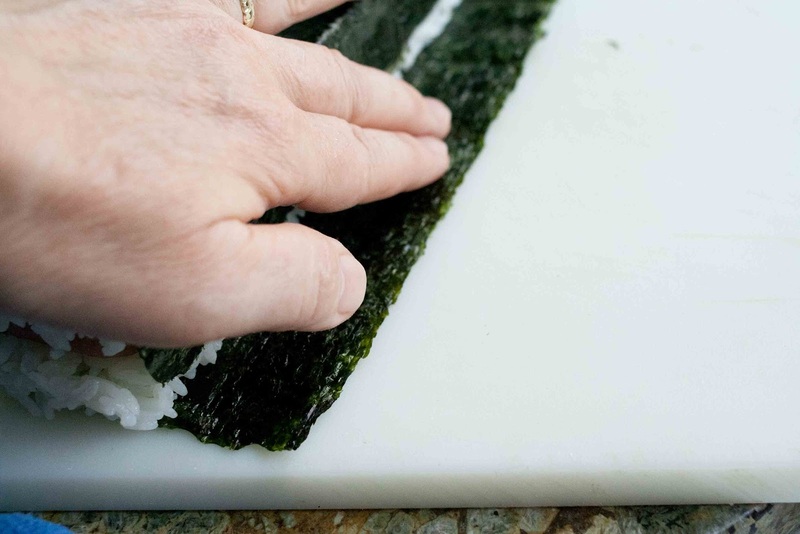 Next, moisten the edge--sparingly--with a little water. 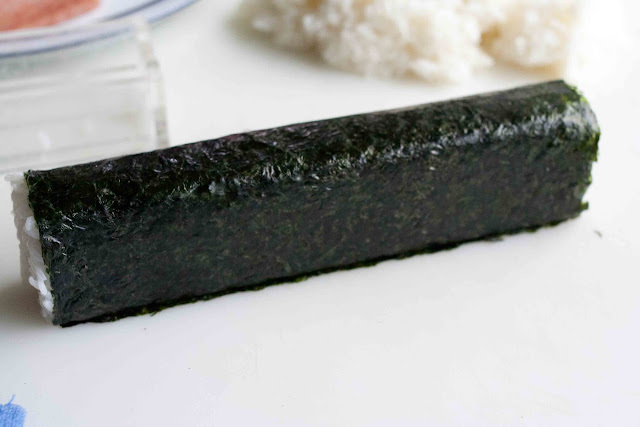 Roll the spam musubi over the edge of the nori and let it rest on that edge. 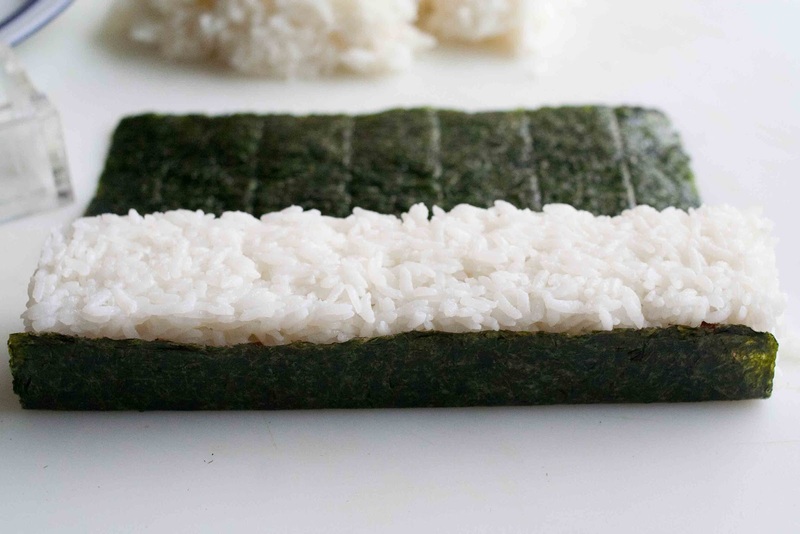 Gently push in the rice at the ends. These are the ridges on the tamper. This is a one slice spam musubi maker, using a half sheet of nori. Best get the double one. 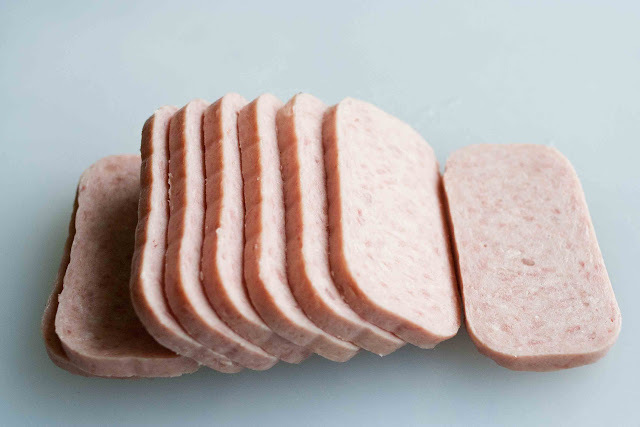 Since I had 9 slices of Spam, I had one left and used my single maker. 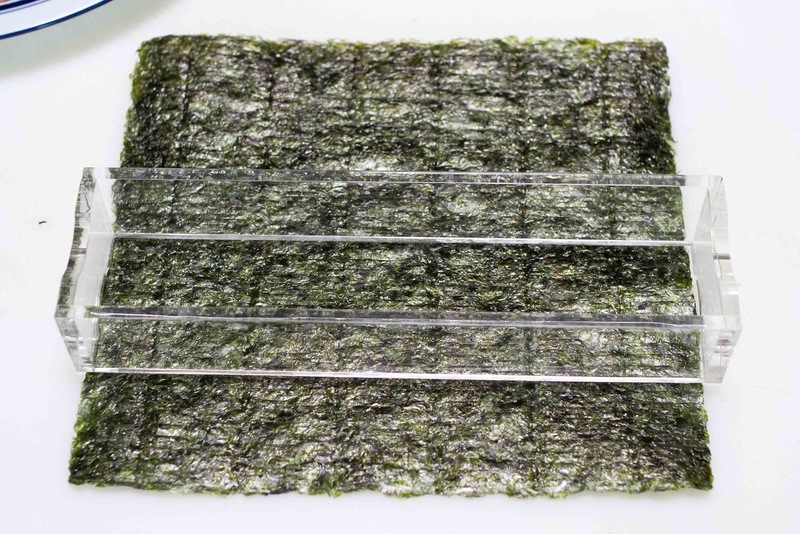 Some people put furikake nori on top of the spam layer, or cook the spam in teriyaki sauce. 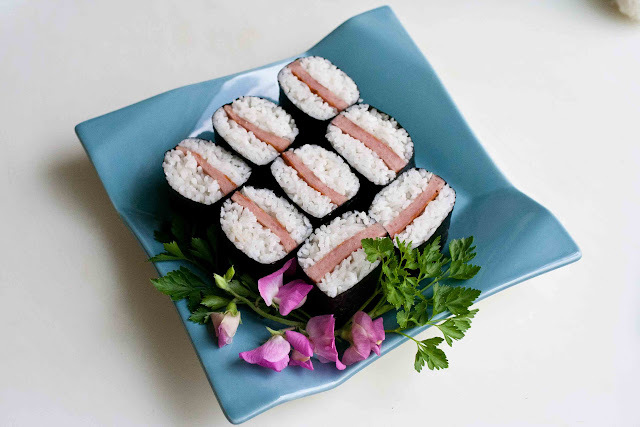 Another good variation is to add a layer egg omelet on top of the spam--a breakfast spam musubi. 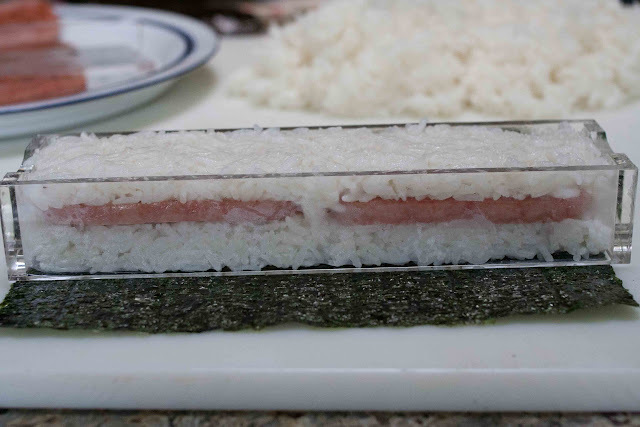 Slice the roll in half, then half again. 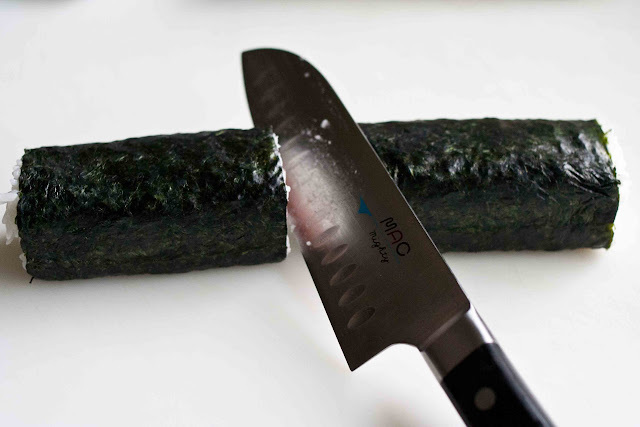 Wipe your knife on a damp, clean, kitchen towel. It will make the cutting easier. This post is for Nicole. Thanks, Nicole, for the requests and questions. 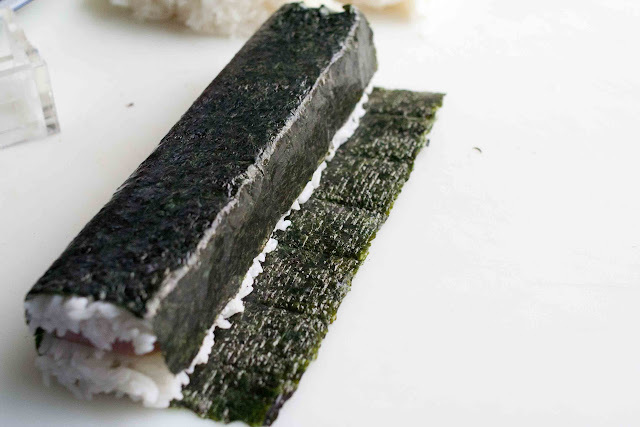 If you have any questions, you can email me--Karolyn@foodjimoto.com. I'll do my best to answer questions in a future post. He liked sunglasses even when he was 20 months old and in diapers. Her first birthday party and Easter egg hunt. Be sure to take a lot of photos of your little ones, they grow up fast. This is my brother Warren and my mom at Easter. They like to hide eggs for the kids. Warren is a lot of fun. 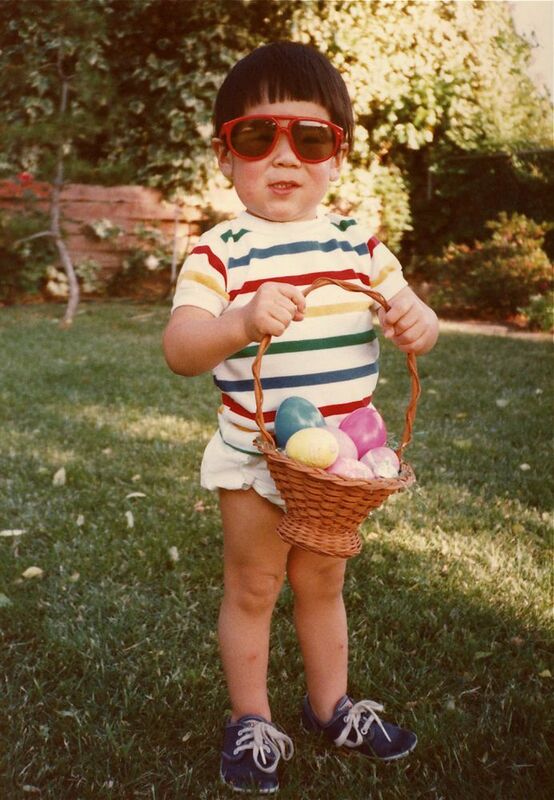 He's been known to put a $50 dollar bill in one of the eggs as a surprise for the kids. 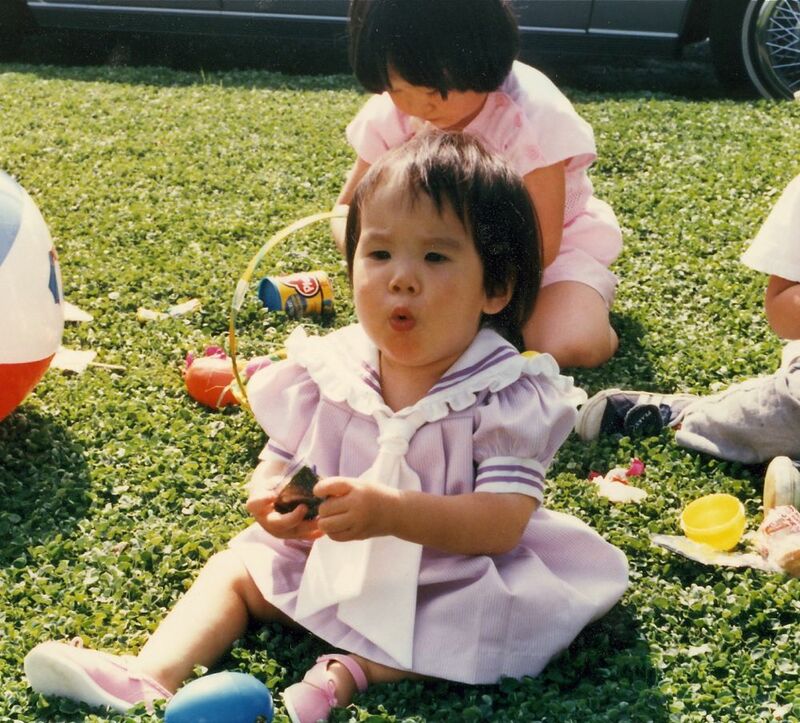 Now that most of them are in their 20's, candy alone doesn't create quite the excitement that it used to. I like to see the delight on Warren's face as he watches whoever discovers the big money egg. When I was little, my mother's father--Norwalk Jichan--used to drive over with an armful of chocolate Easter bunnies every year for us. I bought this one for my mom. 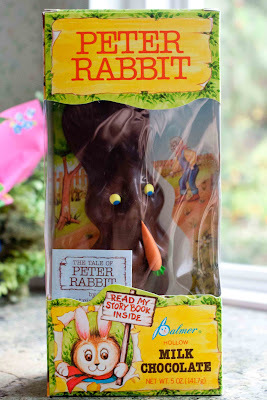 My mom and I love Peter Rabbit. It's the second one I bought for her. I had to get another one because the first one melted in the car. When my kids were little, and we had a family party here at our house, my mom used to leave a present for the kids under their pillows so they could discover it when they went to sleep that night. 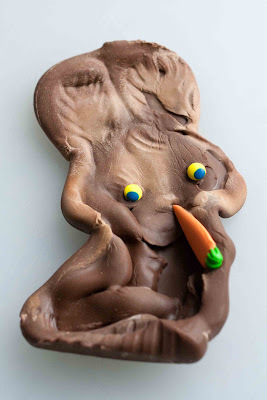 I'm going to leave the chocolate bunny under my mom's pillow. She'll get a kick out of it. 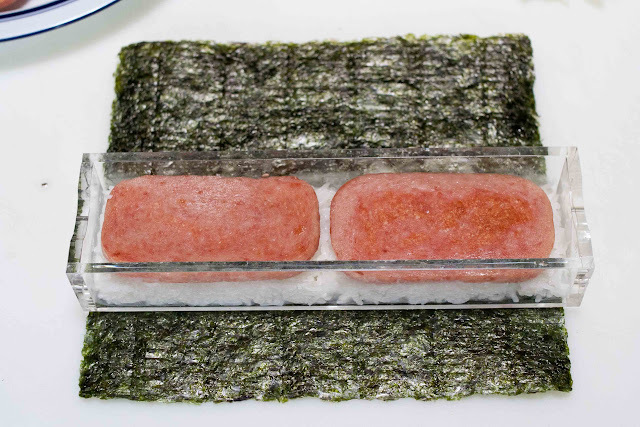 No printable recipe for Spam Musubi yet. Don't forget to let us all know how your mom liked her pillow surprise! 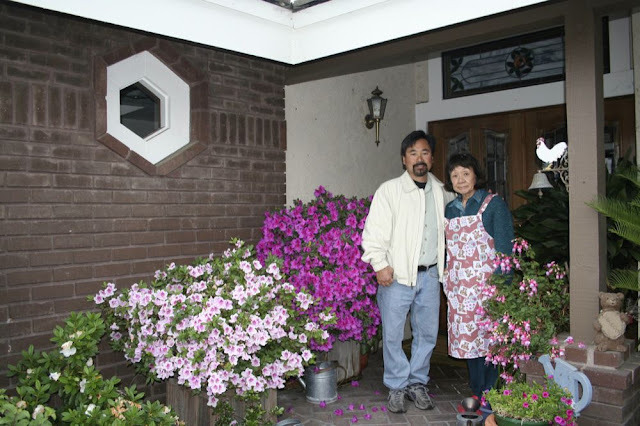 BTW, her azaleas are absolutely GORGEOUS!!! Cute pictures of the kids! 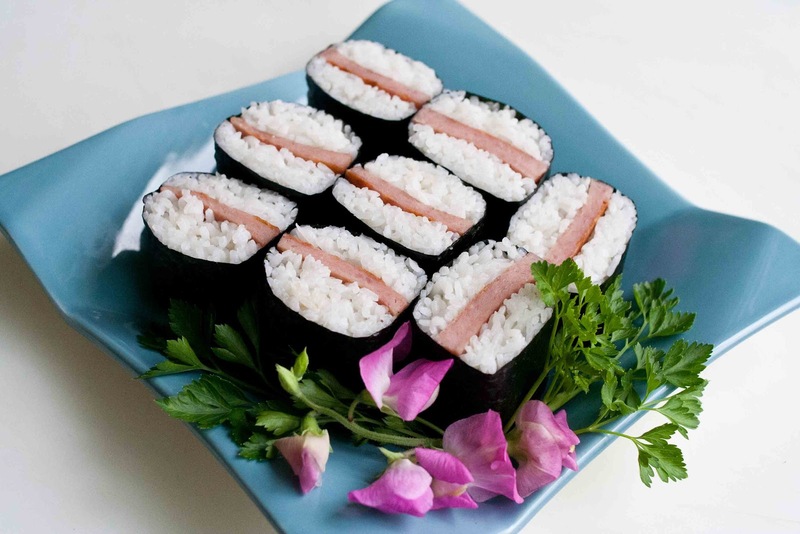 Just to let you know, my stomach is stuffed with all those musubis. Had them for lunch yesterday and breakfast this morning. Yummy. 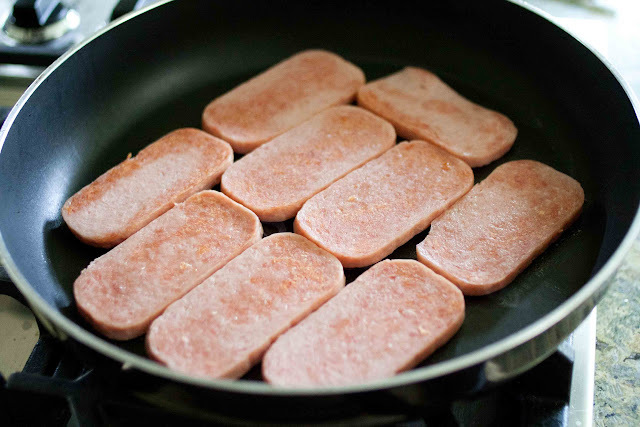 I grew up eating spam, so it's a staple in my house. I never get tired of it. Thank you very, very much!!!! OK, I'm coming out of lurking-mode. 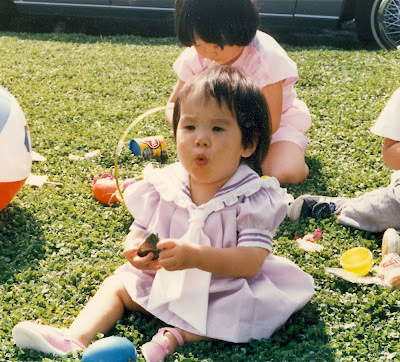 A coworker of mine passed on your blog to me. I believe she is a friend of a friend of your family? I am in love with your blog!! 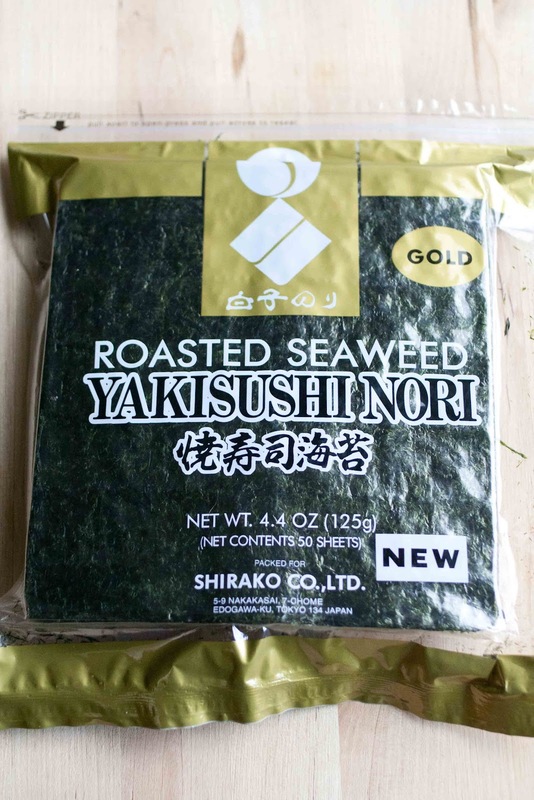 My Grandma used to make all the wonderful Japanese food you blog about. 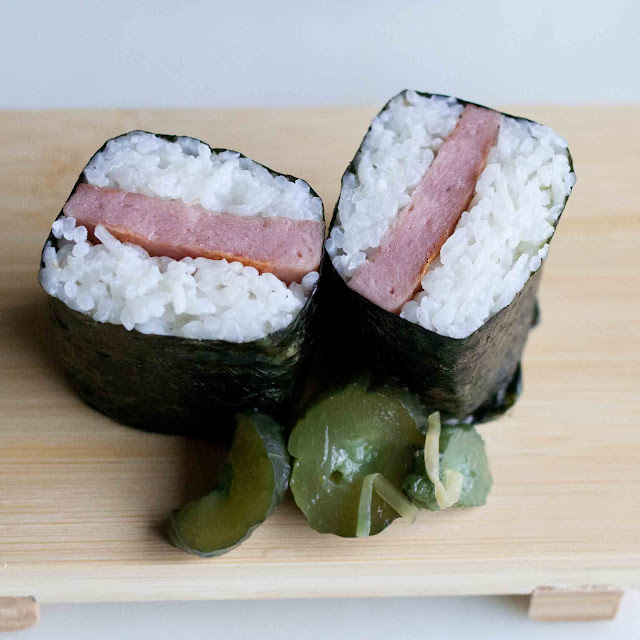 This post on Spam Musabi made me come out and have to leave a comment! All your posts just bring me back to family gatherings on my mom's side of the family. But what I also love is that your non-Japanese food dishes are right up my alley, as well... I love cilantro and mexican dishes. Thank you for your wonderful food posts. Your photos are beautiful! I had passed your blog along to my mom and she said that my grandma (her mom) was in the same camp as your mom in Arkansas. That melted bunny is too funny! 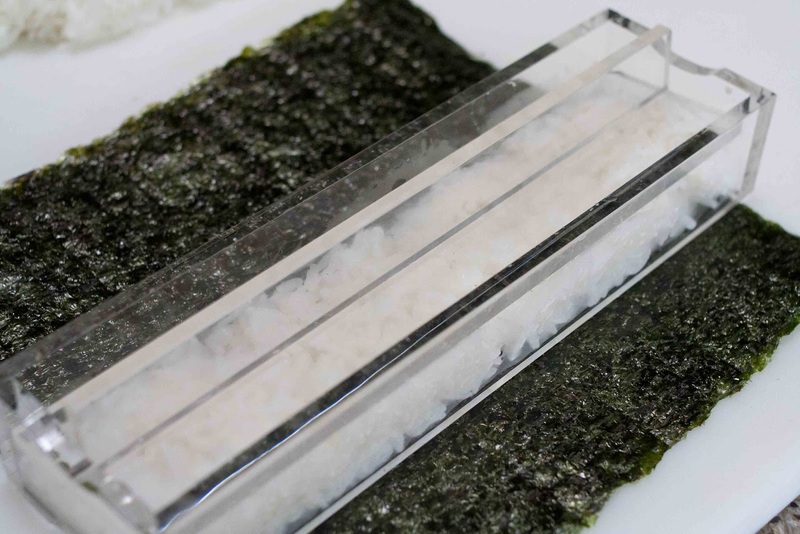 Can u please advise the measuremts of ur musubi maker ie hxwxd? I m gonna order one from eBay to try this spam musubi! Looks really awesome! Love reading ur blog - Thks for sharing ur recipes n also love reading abt ur family, such a close knit family!